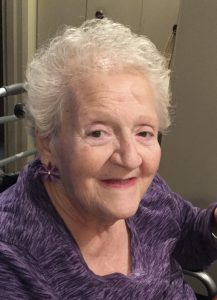 SEYMOUR — Georgiana Rose Tyler, 78, passed away peacefully, Feb. 9, 2019 at Griffin Hospital with her loving husband by her side. She was the wife of Leslie “Butch” M. Tyler Jr.
Georgie was born Dec. 2, 1940 in Rochester, N.Y., the daughter of the late Michael and Mary (Distaffen) Montreal. She raised her family in Bridgeport and was a longtime Stratford resident, moving to Seymour 20 years ago. She was a member of the Church of Jesus Christ of Latter-Day Saints where she served as relief society counselor and Sunday School teacher. Georgie was a Cub Scout den mother for several years and was president of the PTA at Garfield School, where her children attended. She enjoyed making seasonal and holiday wreaths for her friends and family. She was known for being a great cook and baker and her love of New England lighthouses, especially in Portland, Maine. Georgie worked at Robert Shaw in Milford for many years. She was also a self-employed housekeeper. But most of all she was a wonderful homemaker for all of her extended family. Besides her husband of 31 years, Mrs. Tyler is survived by her daughters, Catherine “Cathy” Hernandez and Linda Bordonaro, both of Naugatuck; her son, Stephan M. Grega and his wife, Mary, of Milford; her grandchildren, Ruben Jr., Eddie, Angie, Nikki, Samantha and Mike; her six step-grandchildren; her 11 great-grandchildren; her sisters-in-law, Faye Montreal and Patricia Nolan; and her nieces and nephew. She was predeceased by her brothers, Frank and Gabrielle Montreal; and her former husbands, William M. Grega and Richard W. Mountain. A Celebration of Life will be held on Thursday, Feb. 14, 2019 from 10 a.m. to 12 p.m. at the Alderson-Ford Funeral Home of Naugatuck, 201 Meadow St. Funeral services and burial will be held at the convenience of the family. Memorial contributions may be made to an organization of the donor’s choice.